SURVIVING GIANT: An aged ‘phayung’, or Siamese rosewood stands tall in Pang Sida, for now. Photo from the Bangkok Times. Wild rosewood, famous since antiquity in China and Japan for its unique, blood-hued luster and intricate grain, was once only used for the finest religious statues and princely ornaments. Now, China’s nouveau riche lust for decorative baubles and furniture made of rosewood as a sign of status leading to a massive surge in demand for this precious timber that shows no signs of abating. In just a few short years the price has skyrocketed from just a hundred dollars a cubic meter to over $50,000 today. In just a few short years, the poorly protected forests of Vietnam, Laos and Cambodia have been almost completely stripped of their rosewood. Unscrupulous criminal gangs who control the traffic are now targeting Thailand’s national parks and wildlife sanctuaries, where the region’s last reserves of this precious wood can still be found. Understaffed and outgunned, Thailand’s park rangers are fighting a losing battle to protect the Kingdom’s natural heritage from these determined poachers who will stop at nothing to achieve their ends. Rosewood is famed for its blood-red color, but now it is the real blood of park rangers that is being spilled in the frenzy to exploit this precious commodity. The front-line in this increasingly violent conflict is Thap Lan National Park whose pristine, emerald hills jut starkly from the arid plains of Northeast Thailand with its hardscrabble farms and rural communities. In the 1970s Thap Lan’s impenetrable jungle terrain served as a hideout for communist guerillas, but today a new kind of war is ravaging the forest. Thap Lan’s park rangers face a formidable task in defending this unique, biologically diverse landscape. Covering a massive 2,236 square kilometers, its ecological importance received international recognition in 2005 when, along with four other areas in the Dong Phayayen Khao Yai forest complex, it was designated a UNESCO World Heritage Site. Evidence of Thap Lan’s incredible biodiversity is readily witnessed by visitors. An early-morning trek through the park’s mist-wreathed mountains reverberates with the cries of pileated gibbons and melodious birdsong. Trails are pock-marked with tracks and signs of wildlife that inhabit the forest, including rare and enigmatic carnivores. The demand for rosewood is not only threatening Thap Lan’s rich biodiversity, but it is also putting the lives of its park ranger guardians on the line. Eighteen felled logs of Siamese Rosewood were found near the bodies of illegal Cambodian loggers, along with a collection of handsaws and axes, The Bangkok Post reported recently. The latest deaths bring the number of Cambodians shot while logging across the border this year to 33, according to rights group Adhoc. Photo from Chiang Rai Times. Forests across Southeast Asia have been attacked by poaching syndicates who have infiltrated national parks and plundered their rosewood timber with astonishing efficiency. The species is believed to have disappeared from many forests in Cambodia, Laos and Vietnam, making Thailand the last hope to save this species in the wild. As rosewood stands have declined elsewhere, Thap Lan’s rangers have witnessed a dramatic increase in the logging of these trees in the park that has now reached epidemic levels. Groups of armed poachers of up to 30 or more in number, equipped with GPS units, radios and assault rifles are systematically plundering the forest. Traveling light, these groups bring little food with them and rely instead on killing wildlife for sustenance, causing devastation wherever they go. During patrols, rangers have discovered the remains of many species, including gaur, wild pig, civets, hornbills and dhole (Asiatic wild dog) that have fallen prey to these rapacious hunters. The wild animals in the park are not the only ones under threat. 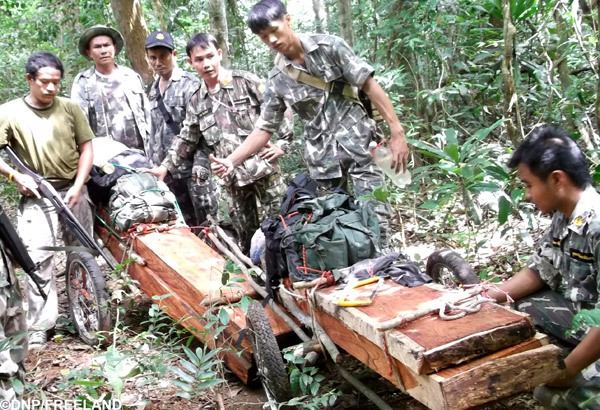 On the 14th of March, 2013, 33-year-old Thaweesak Chomyong, a ranger in neighboring Pang Sida National Park, was killed when a group of rosewood poachers fired on his patrol team before fleeing the scene. Ironically, this tragic incident occurred while the Convention on International Trade in Endangered Species of Wild Fauna and Flora (CITES) was meeting three hours away in Bangkok, and whose delegates had just agreed to regulate international trade of Siamese rosewood (Dalbergia cochinchinensis). Regulations are meaningless if they are not enforced. So far, a lack of financial and governmental support for the park rangers across Southeast Asia has made the CITES regulations toothless pieces of paper in the fight against environmental crimes of which rosewood is just one in a long list. The front-line rangers of Thap Lan face a daunting task. Lacking even basic food provisions, equipment and training, they are tasked with defending huge areas of difficult terrain from large groups of ruthless and violent criminals who would kill them without a moment’s hesitation. The rangers patrol the forest as best they can, hampered by its harsh conditions, under the threat of injury and death and increasingly out-manned and out-gunned. Antiquated weapons and ammunition used by rangers often fail or malfunction, seriously compromising the safety of rangers who increasingly find themselves in armed conflict situations with poachers. In the absence of a national insurance program, injured rangers are left with astronomical medical bills and no pay during their recovery period. Families of rangers killed in action are left destitute following the loss of their only breadwinner. FREELAND Foundation, a Thai-based NGO that fights human and wildlife trafficking, has never observed a threat develop so quickly in its 13 years of operation. Using camera traps on known poacher trails in Thap Lan, FREELAND observed an astonishing 900 percent increase in illegal activity within a three-month period in early 2013 compared to the previous two years. 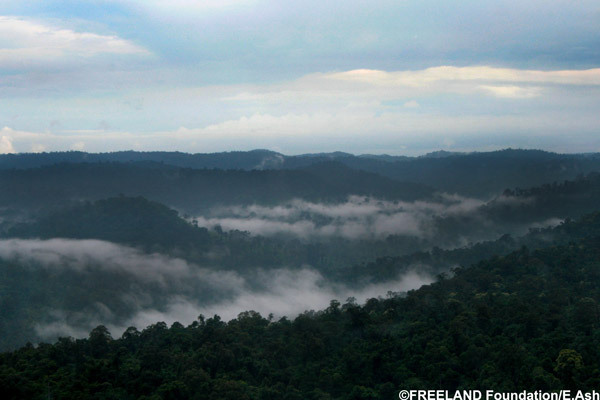 FREELAND is working in both Thap Lan and Pang Sida National Parks with support from SOS-Save Our Species and Rapid Response Facility to provide emergency enforcement ranger training, equipment, provisions and monitoring. The organization hopes to not only help parks intercept and deter poachers, but also to encourage higher levels of the Thai government provide additional support and address some of the chronic issues faced by rangers. There are some encouraging signs. Recently, the Thai DNP announced plans to establish a rosewood suppression and investigations task force for the Dong Phayayen-Khao Yai Forest Complex. The DNP also held its first World Ranger Day event in July of this year. At the event, Thailand’s Minister of Natural Resources and Environment Vichet Kasemthongsri pledged greater support for the country’s rangers in the form of a ranger welfare fund, a group insurance scheme and a compensation program. Reports in the Thai media suggest that a 20 percent pay increase for rangers will be implemented nationally and that over 1,300 temporary workers will be granted permanent employment status. It is not yet certain when these changes will take place. Conservation groups in Thailand recognize that turning the tide in the battle for rosewood requires the full support of the highest levels of government in Thailand and elsewhere in the region. It is believed that transnational criminal groups operating in Thap Lan and along illicit trade routes take advantage of corrupt officials and thereby threaten to derail enforcement efforts. Official corruption has also allowed criminal syndicates to freely traffic rosewood across international borders into Cambodia, Laos, Vietnam and China. Support for local enforcement rangers must be coupled with stiff penalties against criminals and corrupt officials. Regional law enforcement investigations through platforms like the ASEAN-Wildlife Enforcement Network (ASEAN-WEN) are needed to target the kingpins of rosewood trafficking. Consumers of rosewood must also be made aware of the ecological and human cost of the illegal timber trade which they may unwittingly be supporting. Rosewood may not evoke the same passions as tigers, elephants, and other charismatic fauna found beneath the forest canopy, but the pillaging of rosewood in Thap Lan is symptomatic of the war being waged on the environment throughout Southeast Asia. 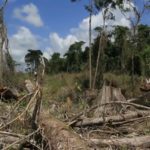 The multi-billion dollar illegal trade in timber and wildlife threatens to commodify and deplete the region’s rich biodiversity while empowering the criminal groups that stand to profit from it. In many cases, it is only the poorly trained and ill-equipped rangers on the front-line who stand in the way of such destruction. Despite the challenges and threats, many of the rangers of Thap Lan National Park harbor a sense of pride both in their work and their park. If asked why they continue to put their lives at risk and endure the rigors of what is often a thankless job, many respond with comments that reflect a deep admiration and respect for the wildlife and wild places they see every day. If the steadfast dedication of those who fight at the front-lines of nature conservation is coupled with greater support, Thailand could very well set itself apart in Southeast Asia as the only country in the region that is truly committed to protecting its natural heritage. The vast forested landscape of Thap Lan National Park is home to some of Thailand’s last remaining rosewood now threatened by intense illegal logging. Photo by: FREELAND Foundation/Eric Ash. Enforcement rangers in Thap Lan National Park seize trollies of rosewood during a field practical section of a FREELAND enforcement training course. Photo by: Department of National Parks, Wildlife and Plant Conservation/FREELAND Foundation.